The present piece represents a dress version of the famous “Cricket” alarm timepiece, in pink gold and featuring a breathtaking enamel dial. 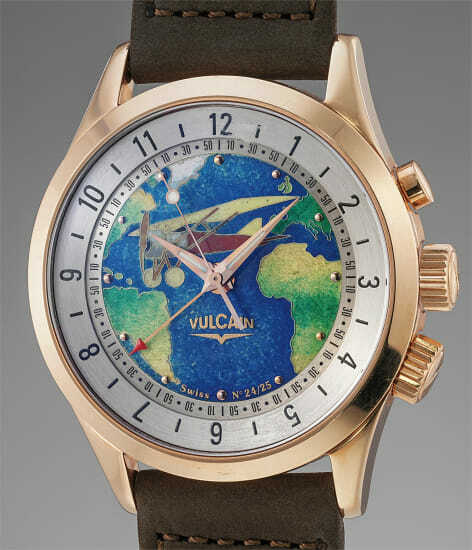 The generous 42mm diameter of the watch leaves ample room for the very large central cloisonné decor, representing the map of west Africa and Europe, and East North and South America with a plane in the center, ideally flying from Europe to America. The rest of the dial features a fixed metal ring used to select the alarm time with the red-tipped hand, and an outer revolving ring used for the second time zone indication. Number 24 of a 25 pieces limited edition, the watch is furthermore offered in virtually “as-new” condition.